Description: Hello everyone I made this lo from the goodies that Betty sent me for Valentine's Day.....just made my day!!! Thank You Betty!!!! 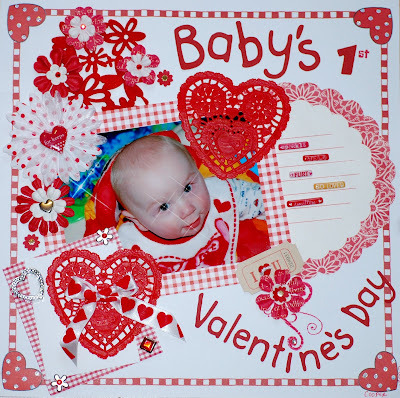 This is Cooper on his first Valentine's Day 2007. The stars in his eyes are from the lens cap (cross). The pp is really old Me and My Big Ideas. Frances Myer gingham pp. Bazzill stitchz floss in button heart. Petalloo daisy w/red spots. Stickles icicles on polka dots on hearts. Prima flowers. The title was done with the FABULOUS CRICUT..Pooh font cut at 1 1/2 and 1. The 1 was cut from Mickey font at 1. K and Company pillow stickers that say Sparkle, Wild, Flirt, So loved, and Smitten!!!! All the things Cooper is!!! MM sweets cheeky hearts that says for keeps! Wilton hearts, brads, rhinestones, I put a rhinestone on the brads liked the effect. Jolee's red verbena flowers. Queen & co. felt. TFL!!! DAWN!!!!!! So glad your back! Missed seeing your beautiful works of art on the MB!! Can't wait to see more! Hope everything went well with your move..you mentioned on the MB! Hope all is well also with you and your family!! I have been so terribly busy so forgive me for not stopping in sooner. Girlfriend, we just have to hookup and have a scrapnight whenever our paths cross. Thank you for all gorgeous eye candy on your blog you have given me to look at! Every layout is truly unique and equally beautiful as the next. You have some serious talent girl! And guess what, I was just awarded another blog award, and yes, you were the first person to come to mind as always! Check out my blog for your award! Lots of hugs, Lynn!